Knocking at the gates, shield maidens meet knights, as the timelines crossover, the village alights…..
Twenty Nineteen’s Medieval Fayre is a Viking style jaunt. A thrall was a serf in Scandanavian lands, during the Viking Age. • Adult Thrall Tickets: R80 online, R100 at the gate on the day. There are only 100 of these tickets available! Jarls were Scandinavian medieval nobles ranking immediately below the king. a fast pass to get you to the head of any queue, a skull mug to toast victory over your enemies from; mead, ale, turkey leg and activity vouchers; a map of the venue and a timetable, as well as overnight accommodation at the venue and Sunday breakfast. There are only 8 of these tickets available! Bairn is an old Norse word for child. a party experience for 8 kids under 12, plus 2 supervising adults, with a fast pass to get each one to the head of any queue, activity vouchers for battles, archery, unicorn rides and more; bornday cupcakes; turkey legs and drink; and free parking for the drivers of this raiding party’s longboats! There are only only 2 of these tickets available! A seafarer is a person who regularly travels by sea to distant lands. a party experience for 8 adults, with a fast pass to get each one to the head of any queue; skull glasses to toast victory over your enemies from; activity vouchers for battles and archery; bornday cupcakes; turkey legs, mead and ale; and free parking for the drivers of this raiding party’s longboats! 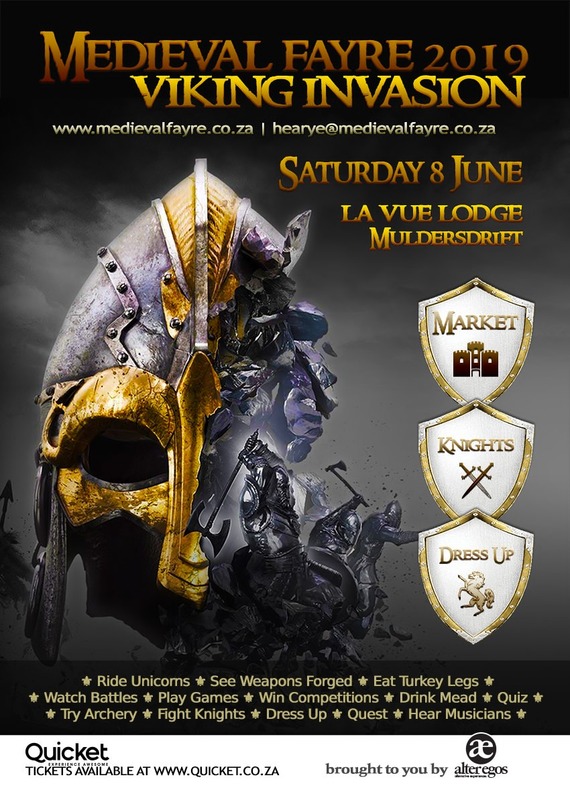 Stall booking now open, stalls from R550 – sign up on http://www.medievalfayre.co.za/stallholders to get stall booking forms & updates.